Those readers who follow the updates will know that Andy Dilla spent 2 months doing volunteer work in Kikima, teaching at the school. At the end of that time his mother, Liz, came and spent time. She had an immediate impact on the community – and the community on her. In addition to the original donation she has made for chairs and tables in the new dining hall she and her son have been asking for donations from their church and community. This month $600.00 more was donated! Two classes at St. John the Baptist in Bolton have made donations. $133.00 came from Mrs. Vistica’s class and $40.00 from Mrs. Savini’s class for goats. Marina Cohen made a donation to provide a wish list and goats. 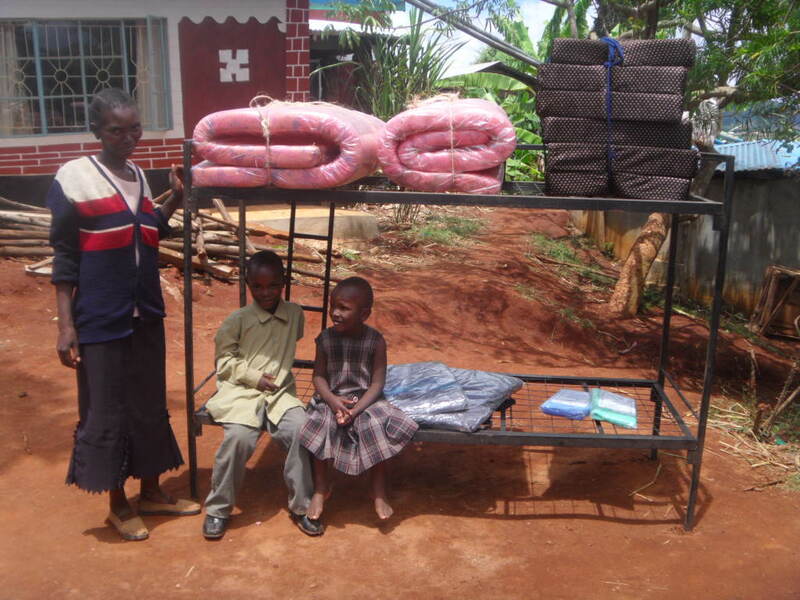 Zheera Yussuf – paid for a wishlist for Mwendwa Mutheu and 2 goats. I presented at a celebration for the Forest of Reading in Hamilton. At the end of the presentation, children came up and gave loose change from their pockets. $4.57 was donated and this will become a blanket for a needy child. Just a quick note to let you know that we are excited to be sending you a donation for $603.54 for the Creation of Hope Project! This money was raised by our Student Council. Some of the money was raised at the Intermediate Valentine’s Day dance, the rest was from our profit from Candy-grams! They are a sweet little treat we send at Valentine’s Day to our ‘secret valentines’. We are glad to see your project updates on the Internet. We hope to continue to make donations in the future. We are anxious to hear how you have chosen to use our donation! 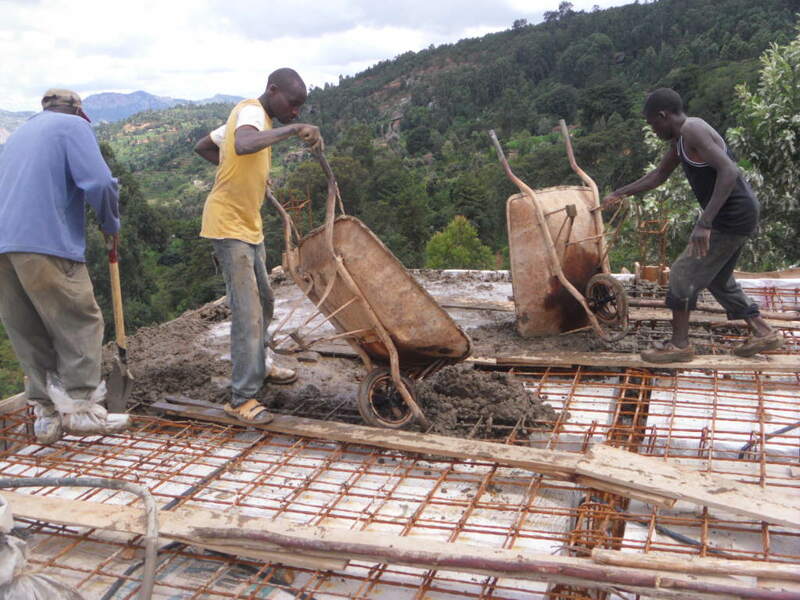 We do not need a tax receipt, and are glad 100% of donation will be used for the project. Also included is a letter that a student wrote about one of your books in this year’s Silver Birch collection. We are using the student letters to invite our Admin from the Board Office to join our Durham Region celebration. We hope to see you back at William Dunbar sometime soon! Today I am an incredibly happy woman. Today the dining and kitchen area has a roof! The top slab was done and the work remaining now is to finish the walls, windows and install the furniture. As I write now, the guys are doing the last bit of casting the concrete. Please rejoice with me on this success. Today is also our last day with our daughter Kay. She leaves for Nairobi tomorrow morning to get a few things in order before she flies out on Saturday in the wee hours of the morning. We, especially her son, will miss her but she is going on a very noble cause. When she comes over to you she will bring our greetings and an update on all that has been happening. $488.80 for cement (47 bags) from Alexander Graham Bell P.S. $64.00 for wire mesh, nails, timber, GI pipe from Weldon S.S.
$800.00 for construction labor costs from Jack Hulland E.S. We are putting in 25 windows in the new building. A large window costs $87.00 and a small window is $60.00. 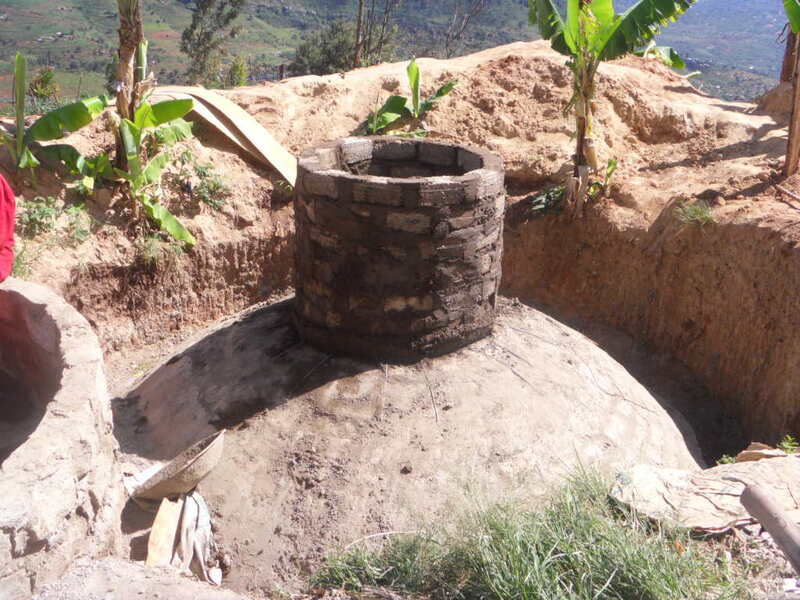 A biogas plant is an efficient, inexpensive, self-sufficient way of producing gas for cooking or heating. 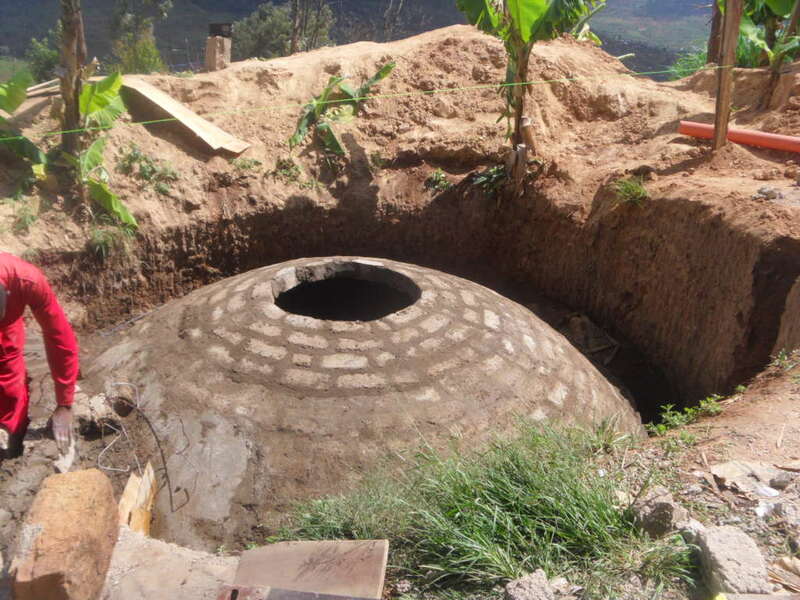 Animal manure is placed in the chamber and produces methane gas which is gathered and used for cooking. The manure that then remains is taken to the fields and used for fertilizer. With lots of cows and goats at the children’s residence and the Kyatha farm, there will never be a shortage of ‘fuel’. 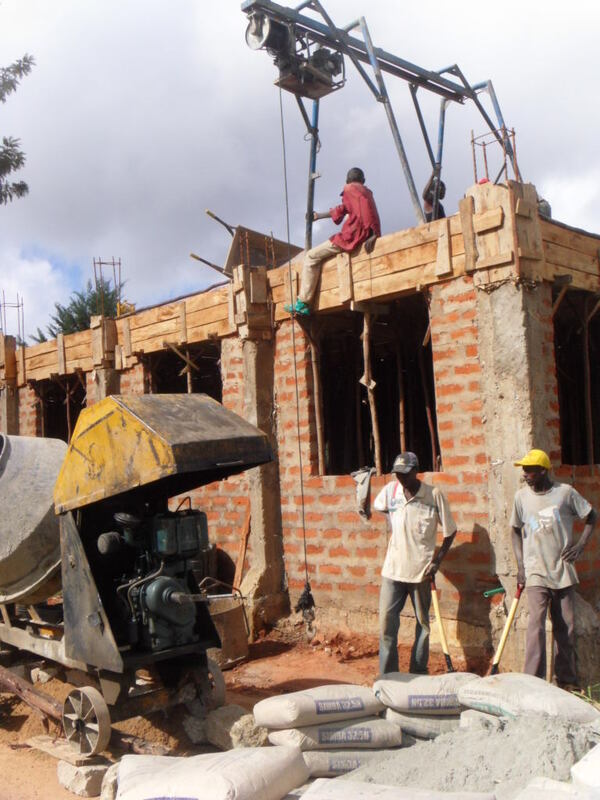 The biogas plant will be finished shortly and will be ready to provide for the orphans upon completion of the children’s residence. No longer will we have to purchase wood to do the cooking – saving the environment and saving money! One of our big projects last summer was to open the Christeena Gay Community Library – the first library in the whole of Mbooni district. We have received directed funds from sources to expand and operate the library. 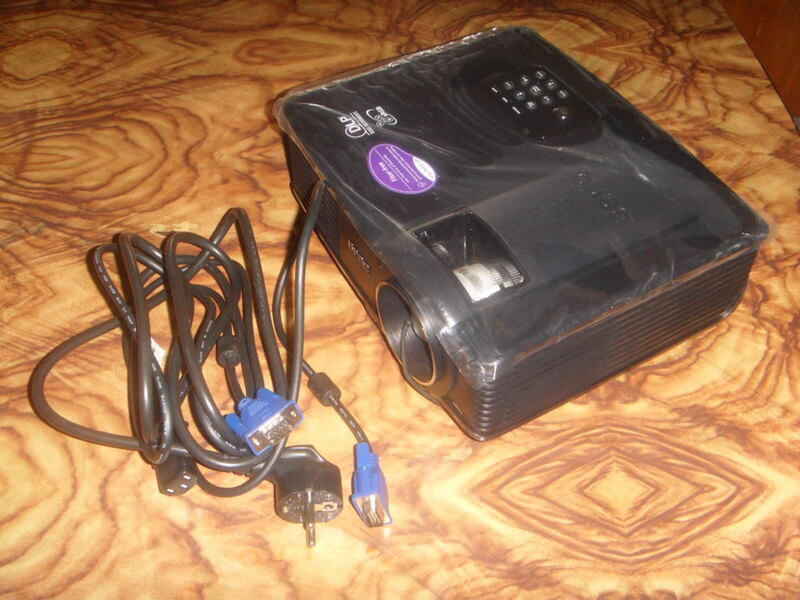 New books totaling $250.00 and a digital projector for $586.00 were purchased. Both of these were funded by money provided by Alexander Graham Bell. The projector is also being used by the children at Rolling Hills Residence. This is opening up the world for these children, most of whom have never travelled more than 60 kilometers from their places of birth. The librarian received training in Nairobi and the Library has been open since November. Not only are the children at the school using it but local people have been coming in regularly, taking a seat and reading. This gift of knowledge is having an impact in the entire community. Here are some newly provided wishlists! We continue to add sponsors to our program – the newest sponsors are Iris and Anja. 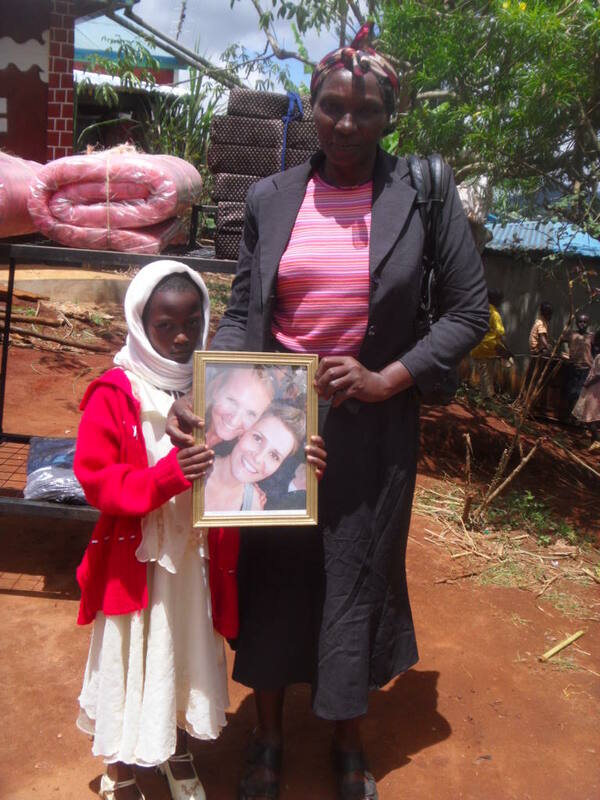 Here is their picture, given to their sponsored child – as always we try to make it as personal as possible. 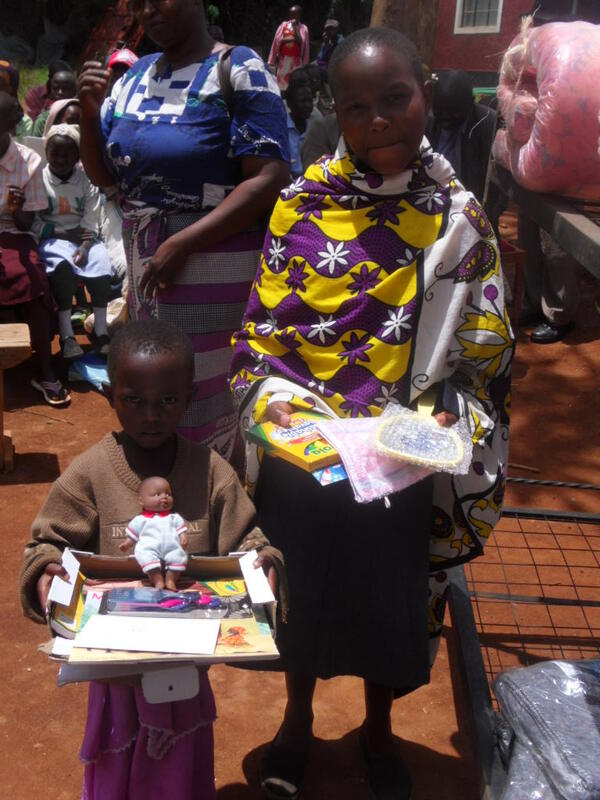 It means so much to the sponsored child to ‘see’ the people who are providing for them. 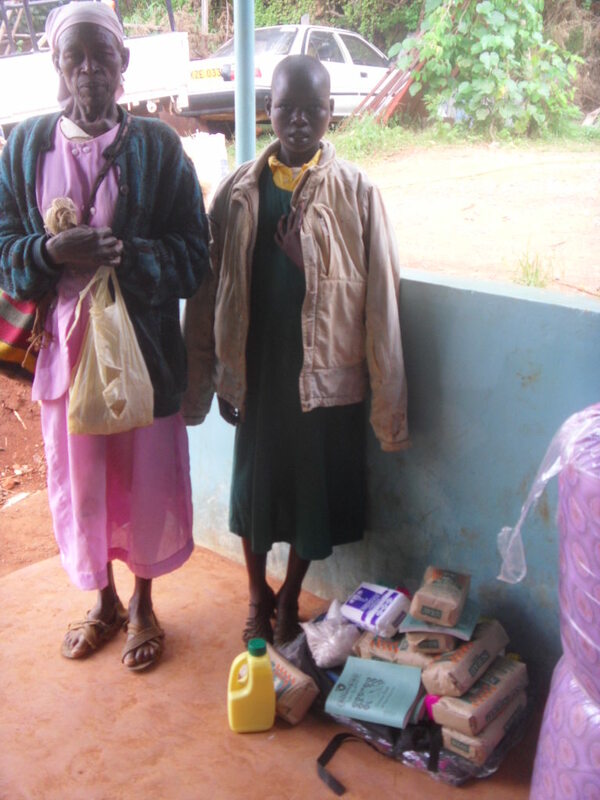 Sometimes our sponsors send over parcels for their sponsored child. 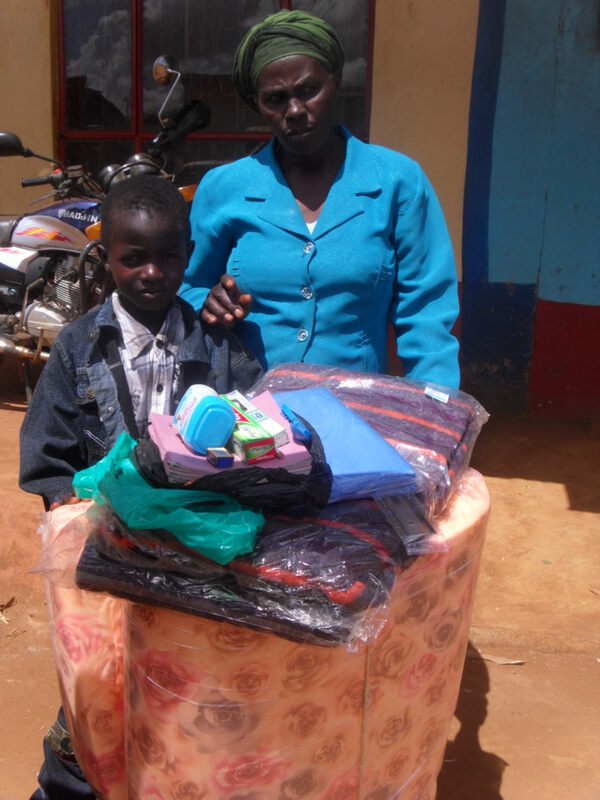 Here’s a parcel sent over by Jennifer Matiatis for her sponsored child. As you read, Kay will be in Canada in May. During the week of May 16th, she will be visiting some partner schools to personally say thank you from the project. On the evening of May 17th, we will be holding an Information and Sponsors evening for those who are interested to meet Kay, see pictures, hear stories, enjoy treats, meet other sponsors and hear about their children. All who are interested are welcome. The event will be held at 7pm at Lorne Park Baptist Church, 1500 Indian Rd, Mississauga. If you are interested in attending, please rsvp to anitawalters@uniserve.com. Thanks to all.